Making your home more energy efficient has a dual “greening” effect. Not only are you saving the environment by cutting the amount of greenhouse gases you emit into the atmosphere, you’re also keeping “green” in your pocket. 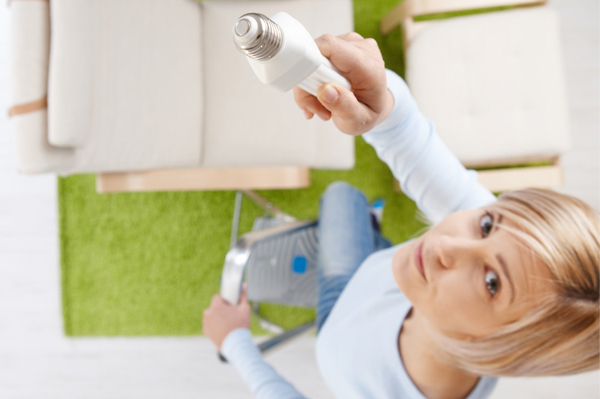 Read on for a few easy-to-follow energy conservation tips. Windows and their frames tend to crack over time, which means cool and warm air can seep into your home affecting its internal temperature. New windows — many of which are ENERGY STAR certified — will help reduce heat gain and loss throughout the year. If buying new windows is too expensive, another option is to caulk the interior and exterior trim of every window — especially if it’s particularly drafty. Leaving lights on in a room that you’re not in is a complete waste of energy. Not only are you using electricity you’re not actually using, the light bulbs you’ve left on produce heat (meaning your home’s internal temperature will rise). So be sure to turn off lights whenever you leave a room. Another suggestion is to swap the types of bulbs you use. Many of the old-fashioned incandescents produce more heat than they do light, whereas newer fluorescent or energy-efficient bulbs produce less heat and last nearly 10 times longer. Most of the energy used in a home goes to powering electronics and appliances. The worst culprits? Refrigerators and freezers. Not only are these always-have-to-be-cool appliances kept running all day, the chemicals used in older models are far less energy efficient than current makes or models (they may even output ozone-depleting CFCs). When you’re not using an appliance or a gadget you probably turn it off. And you probably think if it’s off, it’s not using electricity, but that’s not always the case. Many electronics that are plugged in and turned off (think a radio, the television, a computer, etc.) are actually on standby, so simply turning them off isn’t enough; you actually have to unplug them to ensure they’re not needlessly drawing power from the energy grid. Contrary to popular belief, doing the dishes by hand is not as energy or earth-friendly as using a dishwasher. That’s because many dishwashers — which are now ENERGY STAR certified — regulate the amount of hot water that’s needed to clean dishware (meaning less water is used overall). Everything we do — from showering to doing the laundry — requires energy. So why not cut back on how much you actually use? Wash you hair every other day. Use cold water to wash your clothes. Skip the dryer and air-dry items on a clothes line. Just by using less, you can cut your energy costs by almost 15 per cent. Are Energy Efficient Light Bulbs Safe?